बर्टन in Wonderland. Tim with the Hatter and the क्वीन. 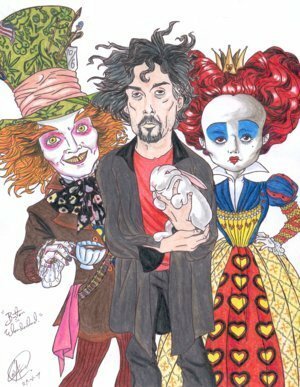 Wallpaper and background images in the टिम बर्टन club tagged: director tim burton fan art wonderland mad hatter red queen deviantart. Tim बर्टन at his हैलोवीन Party in his house in लंडन (Arthur Rackham’s House) on Oct 31, 2011. Tim बर्टन Actually Gearing Up for 'Frankenweenie' 3D?